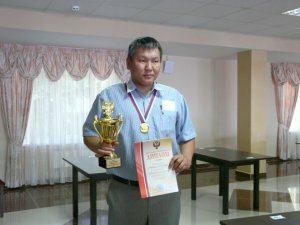 Russian Championship among men and women in Russian draughts was held in Loo (Sochi) from 18 (day of arrival) to 30 September. The strongest grandmasters of the world: current world champion Nikolay Struchkov, world champions in different years Gavril Kolesov, Sergey Belosheyev, Yuri Korolev in men and current world champion among women Zhanna Sarshaeva take part in competitions. Gavril Kolesov and Zhanna Sarshaeva won all programs: classic, rapid and blitz. See results. Сlassical program ended today. Absolute champion in all three programs – classical, rapid and blitz were: in men – Gavril Kolesov, in women – Zhanna Sarshaeva. Classic program are held from 21 to 29 September. See current results. Rapid was held on 20 September. Gavril Kolesov won in men, Zhanna Sarshaevawon in women. Traditional draughts competitions are held in Loo (Sochi) from 18 (day of arrival) to 30 September. As a part of the competition championship of Russia among men and women, championship of Russia among veterans, national competitions among boys and girls in Russian draughts, Cup of Russia in draughts-100 are held. The strongest grandmasters of the world: current world champion Nikolay Struchkov, world champions in different years Gavril Kolesov, Sergey Belosheyev, Yuri Korolev in men and current world champion among women Zhanna Sarshaeva take part in Russian championship. Blitz was held in the first day of competition. Gavril Kolesov won in men, Zhanna Sarshaeva won in women.